He-Man is one of the greatest heros of all time. He is also known as Prince Adam,a nineteen year old Prince of Eternia. He has many friends and one of them is his pet tiger named Gringer, also known as Battlecat. He-Man protects Eternia as well as the rest of the universe from his arch enemy, Skeletor who is an evil sorceror that knows many dark spells and magic. He-Man gets all of his powers and great strength from his power sword and Castle Grayskull. Only a few people know He-Man's true identity. One of them is the great Sorceress. She is the guardian of Castle Grayskull and one of He-Man's best friends. Skeletor is constantly trying to defeat He-Man. 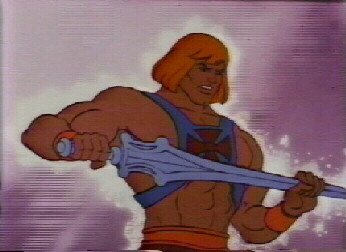 He is also after He-Man's power sword so that he could have the power of Grayskull. There are many secrets and spells that Castle Grayskull holds and with the power of Grayskull, Skeletor is sure to rule the universe. But, Skeletor hasn't defeated He-Man and will never rule the universe. He-Man also has a twin sister named Adora. Most people know here as She-Ra, Princess of Power.She also has many powers. No matter what anybody says I believe He-Man is the best hero ever. He lives in a world all of his own. I also like how everything in his world is all made up. Not many super heros were all made up. Most live on Earth and live in recent times. He-Man lived a long time ago on a far off planet. 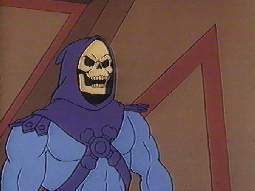 Although He-Man's cartoon deosn't play anymore he never died. It it said that he gave up his powers after he had been coviced that he had killed somebody. Read my myth, Gillas and Debo.